As the micro duct end is fitted into the front end cavity and the tool is rotated,circular edge of the outer micro duct end is chiseled by the angular blade uniformly, to present a gradient slope of the outer edge of the micro duct end which facilitates smooth and precise insertion of micro duct ends into the coupler ensuring leak proof joint and prevention of micro cable getting jammed at the duct ends during cable installation inside a coupler. 65 x 15 x 30 – in mm. II – Cutting Angle – 45 degree. 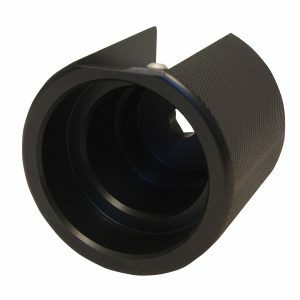 Chamfering tool smoothens the outer circular edge of the duct end by rotating the tool around the duct end while the angular blade comes into play. Gradient slope at the duct end ensures a more convenient and perfect placement of coupler for joining two ends of the duct. 75 x 50 x 41 – in mm.